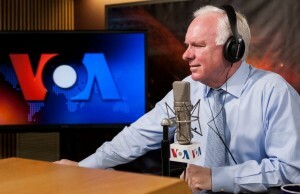 In a victory by critics against government officials trying to claim new powers which they can’t legally claim, the Voice of America (VOA) removed from one of its website pages misleading language suggesting that Americans had to seek “authorization” from the federal government to use VOA programs in the United States. 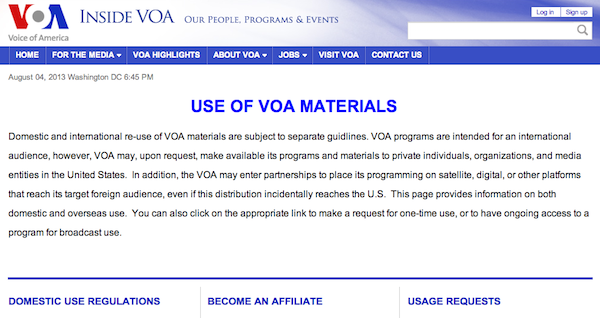 Another Voice of America website page, however, still contains misleading wording about authorization of domestic re-use and re-broadcast of VOA programs. This VOA announcement uses "authorization" language: "VOA programs are intended for an international audience, however, VOA may, upon request, authorize use or re-broadcast of its programs and materials by private individuals, organizations, and media entities in the United States." This corrected announcement refers to making programs "available": "VOA programs are intended for an international audience, however, VOA may, upon request, make available its programs and materials to private individuals, organizations, and media entities in the United States. " Another link on Inside VOA website, http://www.insidevoa.com/info/usage-request/4178.html, had this wording: “VOA programs are intended for an international audience, however, VOA may, upon request, make available (emphasis added) its programs and materials to private individuals, organizations, and media entities in the United States. This second statement is what VOA management now presents as their official position on this issue. The continued showing of two different statements appears to be a result of general disarray in managing VOA websites rather than any lingering bureaucratic confusion over what rights VOA officials have under the law. According to their initial announcement, Voice of America officials clearly claimed for themselves the right to “authorize” Americans to re-use or rebroadcast VOA news programs which U.S. taxpayers already paid for and own. Original VOA programs produced by U.S. government employees, which do not contain third-party material subject to copyright, are already in the public domain. Anybody can use these portions of VOA programs without any permission or authorization as long as all other laws and regulations are observed. However, it is not legal for others in the United States to use all Voice of America or Office of Cuba Broadcasting (OCB – Radio and TV Marti) programs in full – and in some cases, in part – because some contain third-party materials. People who choose to take these materials from websites and re-broadcast them will do so at their own legal risk, agency officials warn. Voice of America and OCB cannot, however, in any case authorize the use of either their public domain or third-party material. Public domain VOA and OCB material already belongs to American taxpayers and its use cannot be “authorized” by government officials. Officials also cannot use tax dollars to buy third-party rights specifically for re-use of their programs by others, including commercial broadcasters, in the United States. Users of such third-party material in the VOA and OCB programs would have to secure the rights to those portions of these programs on their own. 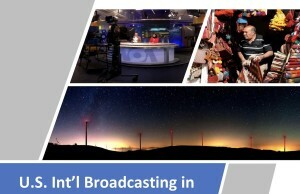 By law, VOA and OCB can still be produced only for audiences abroad. They cannot be produced specifically for American audiences, which would violate the provision that such programs shall not be used to influence public opinion in the United States. Oversight from the bipartisan Broadcasting Board of Governors (BBG) is the main mechanism for making sure the law which forbids domestic news production and targeting of Americans is not ignored by government officials. The new controversial law, the Smith-Mundt Modernization Act of 2012, only grants VOA and other BBG officials the right to distribute their programs in the United States upon request. 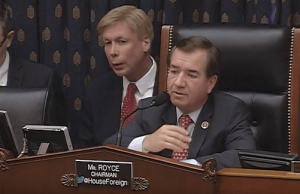 There was no provision in the new law for government officials authorizing, not authorizing or actively marketing VOA and OCB programs in the United States. It appears that the agency’s officials are trying to minimize the amount of content already easily available on the Internet or from satellite. But critics warn that while members of the bipartisan BBG Board may have the best intentions, government officials within the BBG’s International Broadcasting Bureau (IBB) as well as top VOA and OCB executives have to be closely watched to make sure they do not abuse their new powers to distribute programs. The language previously used by Voice of America officials on their website (and still showing in one place on the VOA website as of August 4) certainly suggests that they may think the Smith-Mundt Modernization Act of 2012 gave them much more power than it actually did. Any U.S. broadcaster, other institutions or individuals planning to re-broadcast or re-use VOA and OCB programs may definitely want to seek independent professional legal advice. It would also be wise to contact the Voice of America, Radio and TV Marti, or officials of the International Broadcasting Bureau for additional information. Disclaimer: This website contains only general information about legal matters. The information is not advice, and should not be treated as such. ← Previous Story Much of Voice of America content is third-party copyright-protected and cannot be easily re-used commercially in the U.S.